Northeast-Western Energy Systems (“NES-WES”) has strategically partnered with Q8Oils to be an exclusive distributor to offer complete comprehensive fluids packages which include lube oil, gear box oil and coolant. Our goal is to provide the longest lasting oil life at the most cost-effective price that will significantly lower your overall lubricating oil costs. 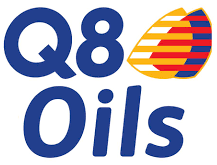 Q8Oils Mahler is a range of high-quality lubricants for engines using all types of gas, including natural gas, biogas, landfill gas, sewage and other highly polluted gases. These oils offer outstanding benefits such as high oxidation and nitration resistance for long service life, low ash deposit tendency and good resistance against pre-ignition, excellent anti wear properties to protect the engine against valve seat recession and high acid neutralizing capacities as a result of high Total Base Number (“TBN”) retention. Gas engines are subjected to extreme operating conditions, especially around the combustion chamber. This results in significant technical challenges for lubricant manufacturers, particularly in terms of oxidation- and deposit control with outstanding TBN retention. Operating conditions vary substantially and Q8Oils can provide advice on the best oil for your application. NES-WES will perform comprehensive expert analysis and management of lube oil, coolant and fuel gas sampling to ensure adherence to OEM requirements.